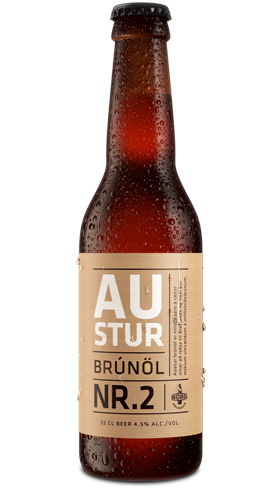 Austur is a brown ale, a type of mild ale with roots in England where it was popular in the interwar period. Mild ale has a refreshing taste, and the character of Austur is distinguished by malt with a strong hint of caramel and notes of dates, licorice and raisins along with a smooth toasted aroma. The Fuggle hops employed to balance out the sweetness are the namesake of one Richard Fuggle, who first grew them in 1875.